MDG congratulates Victoria Chouris, vice president and chief operating officer of the South Florida Fair & Palm Beach County Expositions, on being awarded the 2010 Individual ATHENA Award through the Chamber of Commerce of the Palm Beaches. ATHENA Award recipients are selected for demonstrating determination in achieving the highest level of professional accomplishment in their chosen field. Recipients have contributed valuable service by devoting time and energy to improving the quality of life for others in the community. They also actively assist women in realizing their full leadership potential. Her efforts have helped the South Florida Fair become an exciting display of the best South Florida has to offer, a distinction MDG was selected to communicate through advertising and branding for the 2011 Fair. This award reaffirms Ms. Chouris’s reputation for promoting excellence, community service, leadership and mentorship of women. Ms. Chouris, has been with the Fair for 25 years and has chaired two statewide associations: the Florida Federation of Fairs and Livestock Shows and the Florida Festivals and Events Association. The mission of both is to mentor individuals in the event industry. She is a member of the Miss America scholarship organization, a group that recognizes young women for their contributions to their communities. 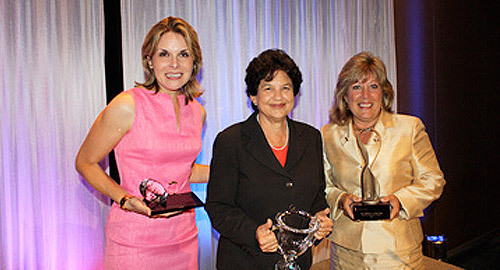 This year’s ATHENA Awards took place on Friday, September 17. Local area leaders, businesses, and young professionals came together to honor three exceptional recipients. In addition to Ms. Chouris’s award in the Individual category, awards were given to the City of West Palm Beach in the Business category and Sarah Alsofrom, State Attorney’s Office in the Young Professional Leadership category. MDG Advertising is a full-service South Florida advertising agency, with offices in Florida and New York, that specializes in developing targeted internet solutions, exceptional creative executions, and solid branding and media buying strategies that give clients a real competitive advantage. For more information, call 561-338-7797 or log on to mdgadvertising.com.